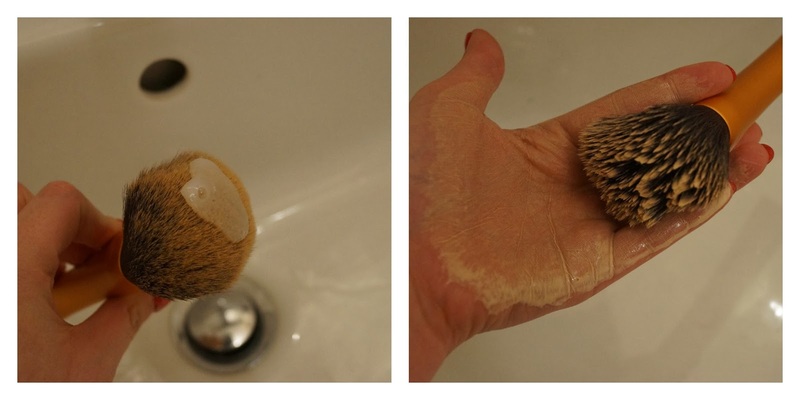 Beautiful You: How I Clean My Brushes! It is one thing to have good brushes to apply your make-up with but keeping them clean can be a bit of a hassle in itself! However seen as I have invested in Real Techniques brushes I try and keep them as clean as I can and give them a rise quite regularly and I have been asked several times how I do this so I thought that I would share it with you! First off I run the brush under hot water to make it easier to lather the baby shampoo into the brissles, I find that using hot water over cold removes the makeup more efficiently and much quicker! I had tried many things from soap, to normal shampoo but recently I have been using baby shampoo which seems to be working really well and I am impressed. However when I took these pictures I was at home and not at uni so I am just using regular soap here but baby shampoo definitely works much better! Next I take a small amount of soap/baby shampoo on to the top of the brush and then swirl it around in the palm of my hand to remove the make up. I keep repeating this procees until when you run it under the water it runs clear showing that there is no makeup left on the brush. It usually takes 1-2 rinses but depending how long I've left it for or how often I use it, it could take more. Then I just lay them out on a flat surface on top of some toilet paper or kitchen roll to dry, I tend to wash mine in the morning after I have applied my make up and then leave them to dry throughout the day and over night and they are ready to use the next day! I try to not leave them for too long but if I am being good I will try to wash them every two weeks or so but if I get a break out or something I will wash them more to make sure it doesn't spread! I hope you liked this post and that it answered your questions. If you have any tips on washing brushes please let me know because I am always open to trying new things!